Collectors of avant-garde electronic music might want to keep an eye out for this composer's work. 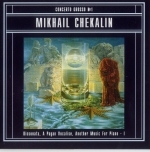 Mikhail Chekalin is now considered one of the top maverick modern composers in Russia. Influenced by the likes of Prokofiev, Stravinsky, Rachmaninoff, and Eastern European folk he began to take advantage of the emerging synth/electronic technology of the late 70s/early 80s to create radical new works. Boheme music is planning on releasing 12 LPs worth of material in the near future. Concerto Grosso No. 1 starts off innocently enough with the 14-minute, "Meditation". This track is a standard ambient composition comparable to similar works released at the time by other composers. As the CD speeds along, though, things get a bit more interesting. Your ears quickly get treated to sinister Stravinsky-esque horns that ride along like on a slow moving trip to hell. The syncopated horn lines are uniquely Russian. Mikhail then proceeds to throw in, or layer if you will, all sorts of elements including 80s sampling, ethnic chant, manipulated sounds, and a room full of instruments. The slow moving cinematic-like drone, led by Zappa-esque horns, builds in intesity and Charles Ives-like density before quieting down. The best part is that the following tracks follow the same formula, more or less. Have I heard anything else like this? Never. This music could have come out of Shostakovitch or Ives, if they had lived long enough to get a hold of an orchestra, a few samplers, and a computer. I wouldn't recommend Concerto Grosso No. 1 to someone not into avant-garde classical and advanced electronic composition, but if you appreciate both genres, definitely check this composer out. Every once in a while, I come across a prog band that is so unique that when it comes time to review I get a bit nervous. This is the case with Epos from St. Petersburg. Ilia, recorded in 1988, is performed by 4 vocalists(2 female and 2 male), 2 violinists, a cello player, a bassist, synth player, and a drummer. The album consists of 4 long tracks that link together to form a continuous 35-minute epic. The 4 sections feature music influenced by traditional Russian folk music. The emphasis here is on vocals rather than on instruments. Vocal sections tend to be done solo(both female and male), accappella, and in unison(choir). When the female singer solos, I'm reminded of old Eastern European laments. The mood is sad, and dark. She is usually followed by a violin theme that reappears during the course of the album. The accappella sections are more influenced by the Russian church chanting tradition. Fortunately, those sections never come off as too religious. Some of the male vocals remind me of Magma. Of course, it's a known fact that Christian Vander borrowed heavily from Hungarian and Russian folk music, so Epos were probably influenced by traditional Russian folk rather than Zeuhl. Whether you will enjoy this album really depends on how much you like vocals, and European folk music(especially from Eastern and Northern Europe). Fans of Magma's Mekanïk Kommandöh will love Epos, but if you're not a fan of Magma, I recommend listening to this album a few times before rating it, because it is quite unique. The open-minded listener, though, will be rewarded. I recently received this CD from Boheme Music International from the Czech Republic. This new label is planning on releasing 35 or so progressive rock albums from ex-USSR states. And after listening to the three CDs that they sent me for review, I can tell you that we will be in for a musical treat. Horizont's 1984 debut, Summer In Town, is a stunning album. The music is at times symphonic in a Yes-like fashion, while other times it borders on synth avant-garde and even RIO(Rock-in-opposition). The sound-quality is excellent and rich with thick keyboards(Yes-like Church organ, Moog synths, and bass pedals), and occasional choir. Their guitarist is influenced by Steve Howe, and provides some tasty guitar chops. In fact, he also reminds me a bit of the guy in Modry Efekt. The album consists of three long tracks. The first track is complex, optimistic, and energetic. Try to imagine a complex, and prog, version of Asia(I'm not kidding!) and you'll have some idea of what the music sounds like. The next two tracks are a bit different, but approach the avant-garde sound that Horizont would experiment with on the next album. These two tracks somehow mix avant-garde synth work(tons of thick Moog work), RIO, with lush Yes-like symphonic sections, and busy prog rock. Some of the passages also come close to soundtrack music. Overall, these two tracks are more avant-prog in nature, but really define the band. Horizont comes highly recommended. Fans of Yes, RIO, and especially analog synths, will love the music here. Horizont released their second, and last, album in 1989. By this time, their symphonic-prog influences had all but vanished in favor of an avant-garde sound. Side A features the 20-minute epic "Portrait Of A Boy", while side B consists of shorter compositions. Without a doubt "Portrait Of A Boy" is one of the weirdest pieces of prog-related music that I've heard so far. It starts off with a 3-note bass line that is repeated for about 5-minutes or so. The guitarist and keyboardist begin to pick up momentum by playing endless melodies, in unison, that slowly gain in intensity(ala Zappa). This then leads into a weird section of avant-garde keyboard experimentation before the band continues into a complex jam. Overall, this epic would please prog fans who enjoy avant-garde, and RIO. The shorter pieces on the second side remind of the second side of Carpe Diem's Cueille Le Joir. Althought the music is pleasant, the band seemed to have been in a hurry to finish the album. If you're interested in Horizont, I recommend getting Summer In Town first. If you end up enjoying that release, or if you're into avant-prog/RIO, then Portrait Of A Boy is an interesting album to add to your collection. 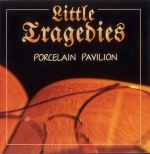 Little Tragedies is a progressive rock project/band started by composer Gennady Ilyin, and Porcelain Pavilion is his 2000 debut release. Gennady's fascination with 70s prog, and his background in classical music led him to try his hand at composing complicated rock music. However, instead of copying the music from a past that he admired, he set out to create something new(win or lose). I have to admit getting a bit nervous soon after the CD started playing. The first 30-seconds of the album sounded too "neo" for my taste, but as my attention span started to drift off, the music suddenly made a few interesting turns and we were soon back in business. It's hard to tell what classic bands influenced Gennady's music(maybe Pesniary?). His music is definitely symphonic progressive rock, and I can hear his classical education. Some passages, especially during the middle part of the album, feature mostly classical instruments(sampled? ), but most of the album consists of playful interplay between vintage keyboard(Mini-moog, etc), bass, drums, and occasional guitar. The keyboard playing is impressive, especially the Mini-moog lines. I don't know how advanced this guy is compared to synth virtuosos, but the subtle nuances(sounds, burps, slides) that he gets his Mini-moog to effortlessly release are impressive to these ears. Russian melodies and rhythms are also noticeable during many sections which gives the album a unique sound. The vocals, which are in Russian and are an important part of the music, are easy to enjoy. They really reminded me of some of the vocals on Pesniary's Gusliar, and at other times I was strangely reminded of Trey Anastasio of Phish. Although I don't understand the lyrics, they seem to be part of a concept. Overall, this ended up being an excellent album. The beginning and second half of the album is where the action is. So, I recommend this CD to prog fans who don't mind Russian vocals(I personally think Russian is one of the coolest languages for rock music), and are looking for something modern(clear, clean and tight sound, with possible sampling) yet symphonic in a progressive rock way. Return was recorded in 1992 by the unique Russian group Rainy Season This 40-minute album consists of three tracks(20, 14, and 7-minutes). The music seemed quite strange to me at first. My ears were treated to music of an ambient nature. Instruments like the flute, glockenspiel, triangle, woodblocks seemed to try to escape from their echo-y, reverb-drenched, world without success. The overall atmosphere seemed mellow, haunting, and Zen-like. At other times, I could hear guitar, and various spacy synth-like effects. Soon, however, new detail started to emerge after each listen. This music might not appeal to most prog fans, but the album needs repeated plays to appreciate. Overall, Return is recommended to ambient, electronic, and/or movie soundtrack fans.